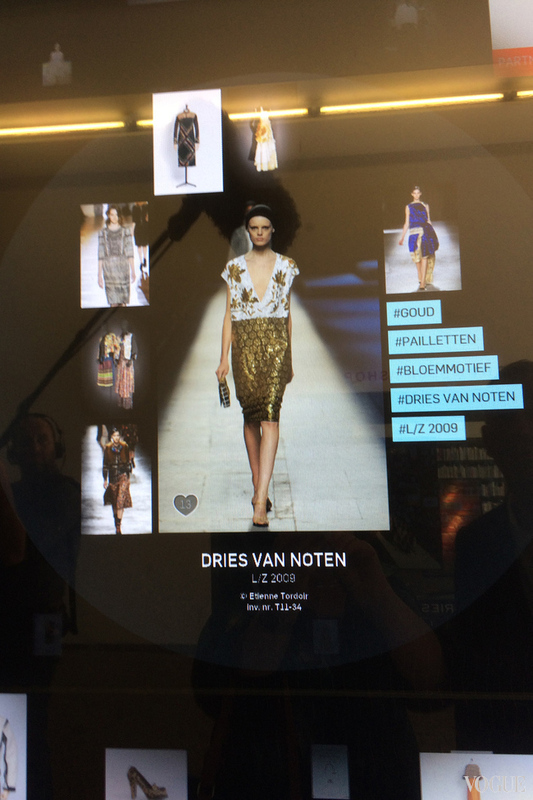 The fingers stretched to the touch screen loaded with pictures and videos of Belgian fashion. The first click was on “Martin Margiela” with images and time lines. Then a tap on “Walter Van Beirendonck”, with pictures of a wildly checked coat and crazy striped knitting. 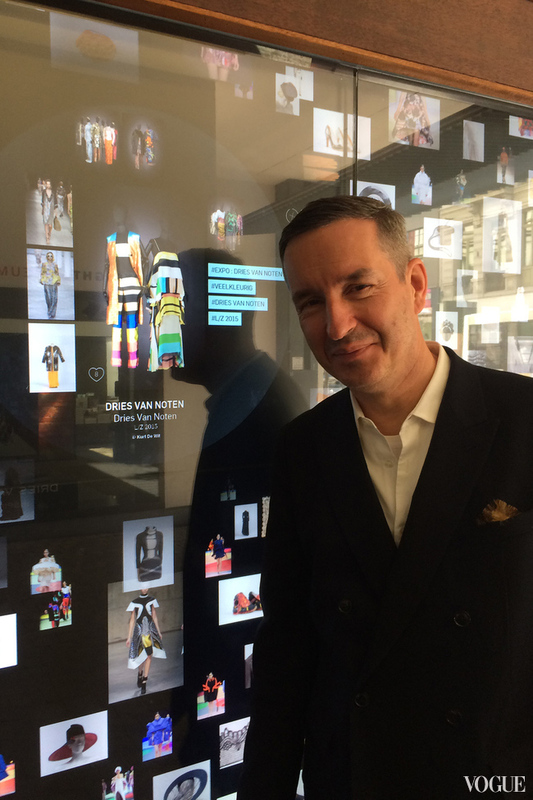 It says a lot about Dries Van Noten that the last name he chose to click on – at the digital wall outside the MoMu entrance to the Antwerp Royal Academy – was his own. There was the same self-effacing attitude when eager visitors asked, “Can I have a picture with you?” Then, while I went to the Academy’s upper level with its panoramic view over the city, to see Walter and the judges of his students, Dries slipped quietly to the book store. I was in Antwerp, always an intriguing Belgian city, with its wharf, harbour and tall, thin houses, to see <Inspirations>. 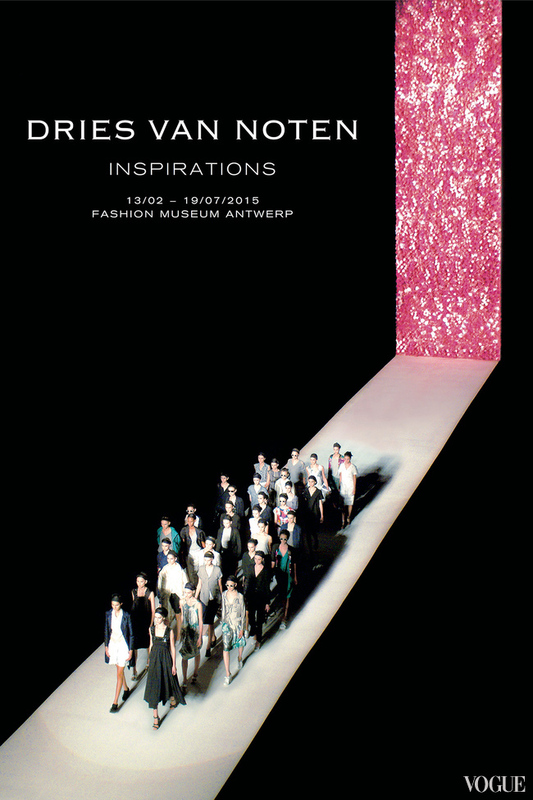 Although I had been three times to the Dries Van Noten exhibition at the Musée des Arts Décoratifs in Paris, I was intrigued to see how that exceptional meld of art and fashion would be presented in the designer’s home town. The exhibition was smaller and calmer than the French version – not so many objects crammed together. But having Dries there made me think more deeply about what he was trying to say. The exciting thing about the exhibition is the juxtaposition of objects put together to give an element of surprise, or even shock. How could the famous Christian Dior Bar outfit, with its nipped-in waist and vast skirt, have anything to do with a vivid blue splatter of a moving figure from Yves Klein and the Dries designs of trench coat and trousers? The caption to this section, under the title “Punk”, read: “Rebelling against and subverting codes of social behaviour are the sparks of creative ingenuity. Defying established tradition empowers a break from stereotypes of form; mocks our behaviour; and permits the birth of new archetypes.” It was fascinating here – and throughout the exhibition – to reach the inside of a designer’s thought process. The practical and poetic sides of Dries, 57, also came through in other ways. He told me that he thought that a 1943 shapely suit from Madame Grès, using just two and a half metres of fabric, was just as “feminine and luxurious” as Dior’s 18 metre Bar that brought angry women out on the Paris streets protesting the waste of material. 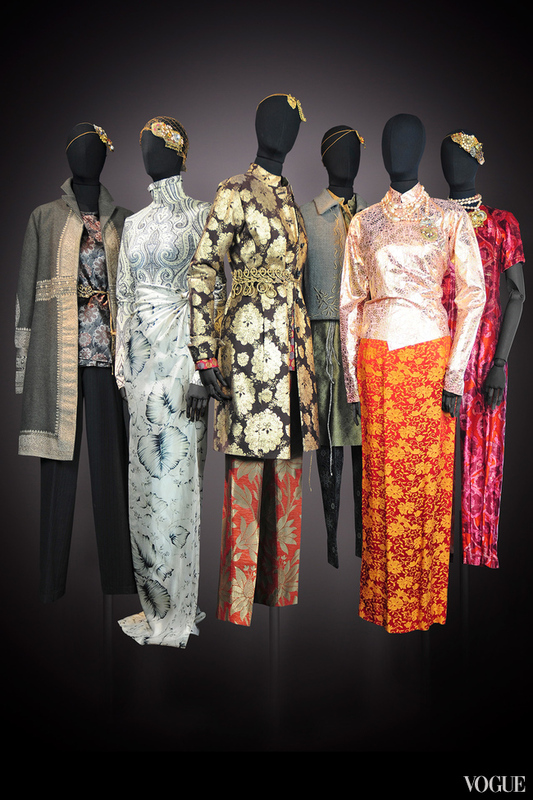 All the historic clothes in the Antwerp exhibition come from the Musée des Arts Décoratifs, while Dries pieces might come from the Académie Royale des Beaux-Arts d’Anvers. But the sections themselves, from gold to grunge, come from the magpie Van Noten mind and his relationships with artists. On one side is a window of “ isses” using images from the Thomas Crown Affair movie of 1968 to Man Ray or Robert Doisneau photographs. Another window features the influence of the New Zealand film The Piano , which had inspired a sea-soaked effect of plasticised dresses, “everything dripping, clinging to the body”. I became mentally dizzy trying to follow the Dries train of thought that took his “grunge” inspiration from Kurt Cobain through Lucian Freud’s studio to wilting flowers and his own “iconic” garments, such as checked shirts, trench coats and tuxedos. Easier on the eye were men in flowers – clothes with floral decorations from Louis XV to Jimmy Hendrix in the Sixties to flowered surfing shorts – not to mention Dries’s own garden that he described to me later at lunch with his partner Patrick Vangheluwe in the unexpected summer sunshine. Suddenly a breathing space and a waft of flower scent came as we walked through a tunnel dividing the collection into two halves. The “wall” was saturated with interactive olfactory panels created by the Norwegian-born, Berlin-based artist known as Tolaas. It was followed by slow-motion movies that had a mesmerising calm. There was so much to see that I let Dries pick out particular pieces: the Spanish section, with “black, white and pinpoints of colour” set off by the work of Cristóbal Balenciaga and an outfit from Australian alternative rocker Nick Cave. I realised that the juxtapositions throughout were both visual and cerebral: for example, a colourful “Bollywood” moment facing off the grey and white minimalism of Jil Sander. Or India as quiet and graceful as the haute-couture faux sari dress designed by Dior for a Belgian princess. I kept asking Dries how he had succeeded in putting this second museum show together, after Paris, since the Antwerp version had 50 per cent more new material. And the period had included the green “grass” carpet woven especially for Van Noten and now a museum display piece in its own right. “To put on a quality exhibition is so much work that I now I prefer to put my energy into other products,” he said. After we left the Antwerp and the MoMu fashion museum and went over to the Dries Van Noten studio/work space on the waterfront, I felt even more stunned by his energy. After greeting his dog, Harry, we walked through the different floors where each area had a team working on either the creative or the business side: neat piles of fabric; embroideries just arrived from India; artistic prints being worked out on screen. The menswear for this month’s Paris show was already completed, so the next women’s collection was in full swing. I promised not to take any pictures or reveal anything I saw – especially prints – that could be used by counterfeiters. But I was allowed to snap on one of the long wooden tables a vase of summer garden flowers – purple, pink, red and orange spilling over vivid green leaves. “They are from our garden, I brought them here,” Dries said.